The K and M series of Cat motor graders manufactured to increase efficiency in creating flat surfaces, building roads or just upholding them. Newly innovated balanced hydraulic flow system provides steady control and allows for an independent oil supply. The most comfortable and spacious operator cabin in the industry ensures optimum visibility and adjustable control-pods. 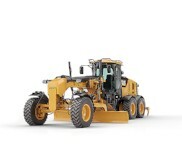 Cat continues to be the leader in the market, with the new K and M series of motor graders. Al-Bahar is proud to bring to you an exclusive line of motor graders to rent in UAE, Kuwait, Oman, Bahrain and Qatar. Built for optimum performance, Cat motor graders are reliable and sturdy. These heavy machinery can be used for a variety of applications including road building, maintenance, heavy blading and even material handling. The advanced electronics and hydraulics system is engineered to boost productivity and work through the toughest of work environments. Al-Bahar Cat motor grader specialists are available to you at any time, simply fill in our contact form and we will have a member of the team get back to you at a convenient time.